For my graduation dinner, my parents and I made reservations at Frasca Food & Wine in Boulder, CO. This restaurant is an extremely nice authentic Italian restaurant. The waiter had to spend about five minutes at the beginning of our meal just explaining what everything on the menu was! We started off with the Frico Caldo as an appetizer. This was a potato, onion and cheese pancake with a chive vinaigrette. This was a delicious savory pancake. Looking back, having an appetizer before a 4 course meal might have been overdoing it. For the rest of the meal, we all decided to order different things so that we could taste as many dishes as possible. If you are going to a really nice restaurant I highly recommend doing this, I think it makes the most out of the experience. For our Antipasti course, I ordered the Pate alla Campagnola. 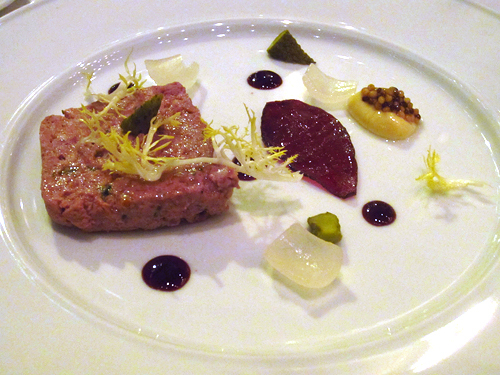 This was a pork pate with polenta, pickles, and a sweet berry sauce. The saltiness of the pickles and the sweetness of the sauce complimented each other in a unique way. I think the sweet sauce was a good way to keep the pate from tasting too salty. If you have a fear of pate or meat mousse, I suggest you get some guts and try them because they are delicious! This was my favorite of the appetizers. 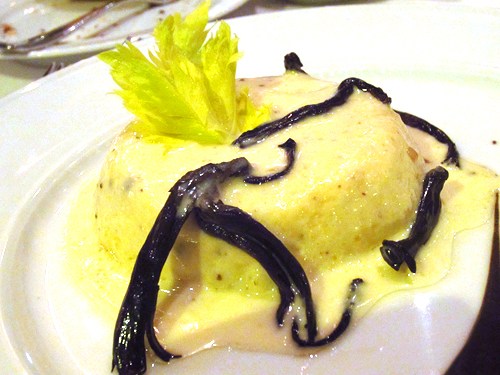 My mom ordered the Sformato, which was a celery root, black trumpet mushroom and black truffle custard. Once again, don’t let your fear of weird textured dishes hold you back! I thought it was a strange idea at first, but ended up eating about half of my mom’s dish! It almost tasted like rich mashed potatoes with celery root and truffle oil. 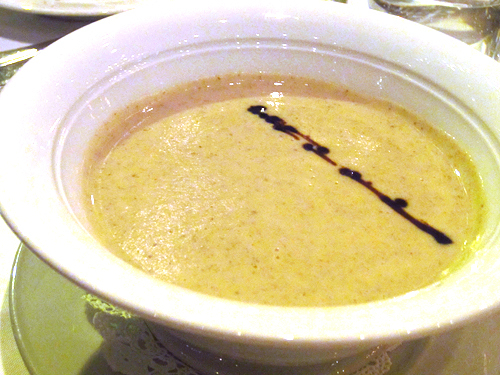 My dad had the Vellutata, which was a Jerusalem artichoke soup with balsamic vinegar. The soup definitely needed salt. I am not sure if they intended to leave it unsalted for guests to salt themselves or if it was just not seasoned enough. Either way, once a generous amount of salt was added it was really good. 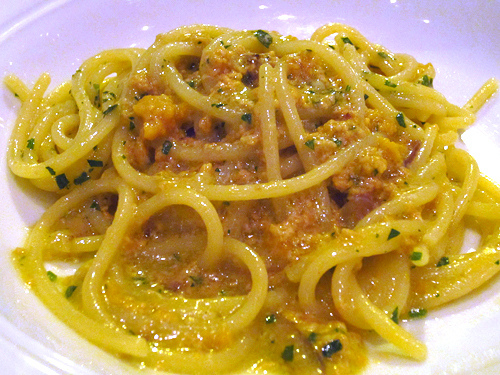 For our Primi course, I ordered the Spaghetti con Ricci, which was spaghetti with sea urchin. This was my first time trying sea urchin, but of course when I saw it on the menu my foodie side had to try it! If you like mussels or clams you would like sea urchin as well. 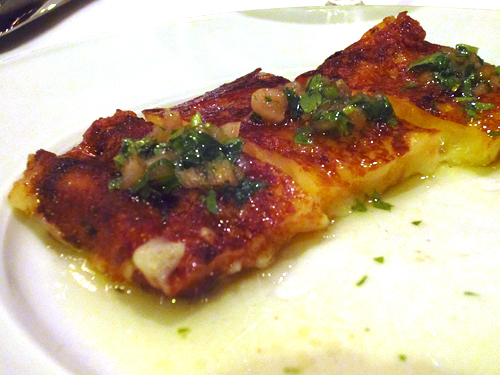 In this dish, the urchin kind of dissolved which created a very nice textured sauce. Once again, my dish was my favorite for the course. 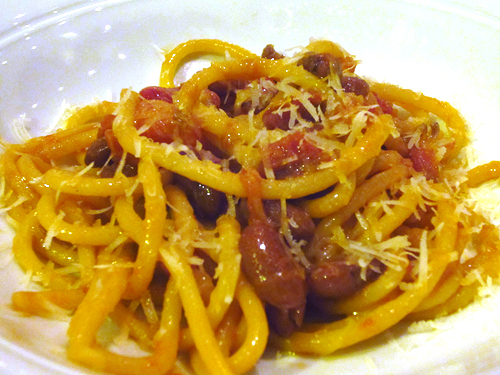 My mom ordered the Bigoli della Casa, which was pasta with a house-made guanciale, shelling beans and hot peppers. Guanciale is an unsmoked Italian bacon made from the pig’s jowl or cheeks. Once again, may sound weird but is so delicious! This dish seemed a little too much like regular pasta and marinara to me, but my mom loved it. My dad ordered the Lasagna al Forno. This was not your average lasagna; it was deconstructed and plated in a very elegant way. I think it is very clever for the chef at Frasca to serve lasagna this way because it makes it much more visually appealing to guests. 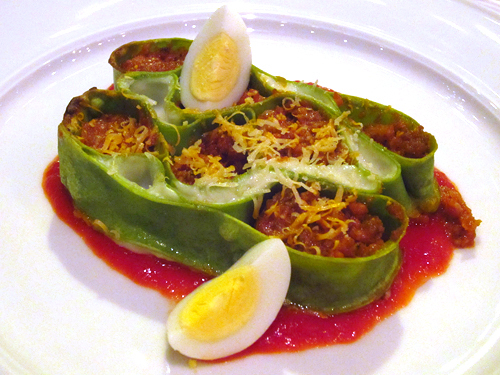 Apart from the beautiful plating, it was your traditional bolognese lasagna with hard boiled eggs as well. For the main course, or Secondi, I ordered another thing that I had never tried, the Faraona con Peverda. 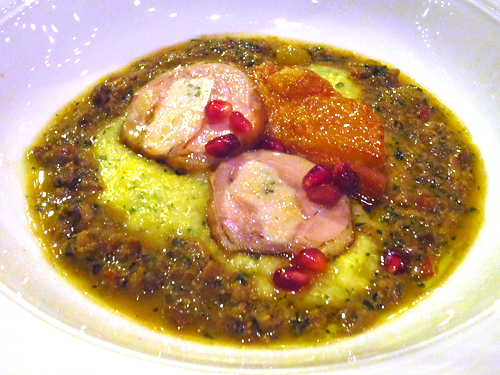 This was guinea hen two ways with polenta and pomegranate seeds. I really enjoyed having the meat two different ways. One was as small medallions and the second was with a crispy skin attached. I am not sure what the sauce around the polenta was, but it was delicious! I do wish they would have listed that on the menu as well. The pomegranate seeds added an additional crunch and a bit of sweetness. 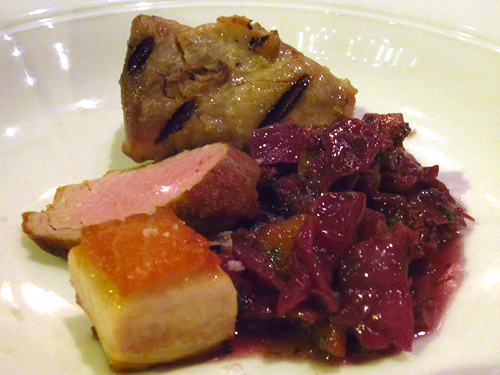 My mom had the Arrosto Misto, which was pork belly, leg and shank with red cabbage and house-made pancetta. If you haven’t noticed my mom really likes pork, which was not a bad thing for this menu! I love pork belly, it is packed with flavor and really can make any dish that much better. This was not my favorite cabbage I have ever had, but it did add a pretty color to the dish. 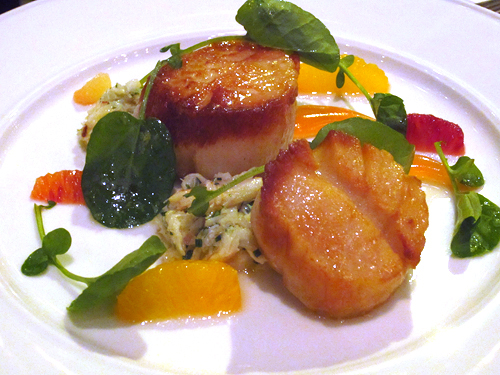 My dad ordered the Molluschi, which was scallops with winter citrus fruits, lump crab and watercress. This was another first for me! I really liked the creamy taste of the scallops. This dish was very rich, but the light citrus fruit added a nice freshness and kept it from feeling too heavy. I am happy that I was able to try scallops without bacon for my first time, because now I know that I truly like them, rather than just the bacon. As if we weren’t full enough, we still had dessert. 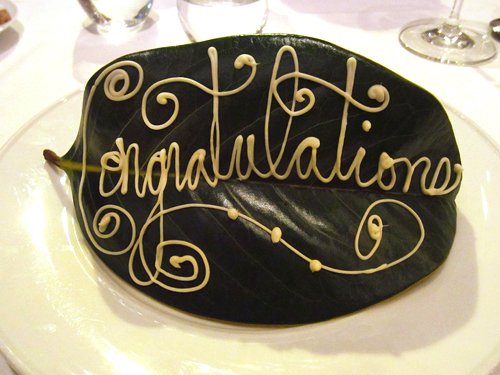 The waiter had overheard that I had graduated so they plated my dessert with a giant leaf with “Congratulations” written on it with white chocolate (which I found myself picking off and eating). 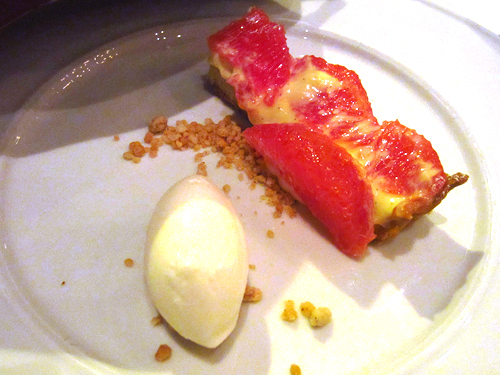 My actual dessert was the Crostata di Pompelmo, which was a grapefruit tart with almond frangipane (if you have never had frangipane you need to make my mom‘s Apple Tart recipe that I posted a while back), vanilla bean pastry cream and a house-made citrus frozen yogurt. I think I prefer my mom’s apple tart to this citrus tart. The grapefruit was kind of a strange contrast to the frangipane and pastry cream, although I must admit I still ate the entire thing so it definitely wasn’t bad. My parents both ordered the Panna Cotta, which was a chocolate panna cotta with a caramel layer on top and biscotti on the side. 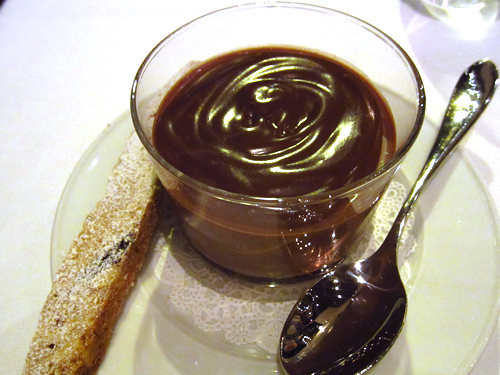 Panna cotta is an Italian cooked cream gelatin dessert, similar to a custard but with gelatin to create a concrete shape. Biscotti are twice-baked Italian biscuits. We each only had about two bites of this dessert; it was SO rich! It was delicious, but I think one serving might put you in a coma if you ate it all yourself. This dessert could easily have served 4. Overall, this was definitely my dream meal! I was able to try all sorts of new things, which I absolutely love doing. The service was great. Our server overheard my mom and I talking and asked us if we were in the industry; my mom told him about her cookbook she is writing and her business and I told him that I was a cook at SALT. He ended up giving us $25 off our dinner and complimentary dessert cocktails just because we were in the industry! I don’t know if this is something they do for everyone, but it was really nice of them. If you want to eat at Frasca, I suggest you make a reservation very far in advance because they are always packed. With food this great, it is no surprise to me that they won the title of Best Restaurant by 5280 magazine. I think going out to restaurants with family is a wonderful way to celebrate such a huge accomplishment. This way you will remember it for years (whereas a night of drinking might end up a little hazy!). WOW! Don’t you ever look beautiful. Love your eyes and brilliant smile – besides all the lovely food (dream meal indeed!) CONGRATULATIONS! Your parents must be incredibly proud of you. What an amazing dinner out! I didn’t realize you lived in Colorado. I just moved to Fort Collins. We will definitely have to think about trying this place, looks amazing! Congrats on graduating! Jenny! 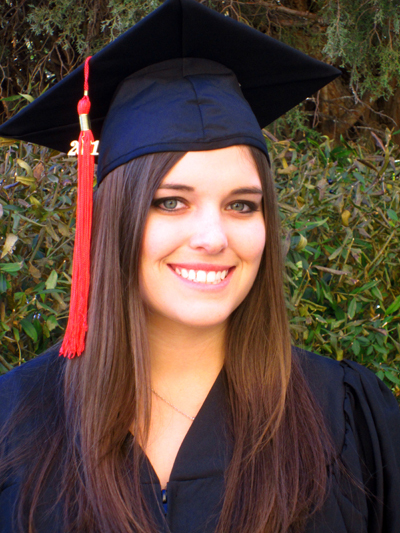 Congratulations on graduation! That’s really such a huge accomplishment. I just read your Mom’s post and left a very soppy comment (one Mom relating to another). Your future is so bright and you are such a remarkable young woman. Can’t wait to hear what is next! Congratulations my dear!!! What a great way to spend your 21st!! I actually did the same for mine, ate at the best Santa Barbara restaurant and drank wine! That Frisco Caldo looks amazing!!! !